Do you have a severe allergy to bad wine? 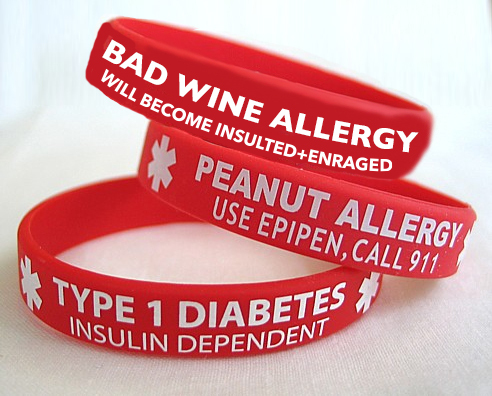 Wear a wine-alert. My colleague was remiss as to why I do what I do. Am I a martyr or masochist? One particular wine I tried this week had me questioning my motives. I’m a gambler, hoping to hit it big, bold, flavorful and complex for under $10. So there you have it. He still vehemently insists that I am a part of the liberal elite who does not practice (serve) what we preach (drink) – but I will assure you – I am an equal opportunity drinker and I would never lead you astray. I buy these wines with my own dinero and write only the truth. I actually take this job very seriously. This heated conversation that nearly ended in fisticuffs only belies the passion for drinking good wine. Anything less is a personal affront. I also think my friend may suffer from a severe allergic reaction to bad wine – makes him irritable, angry and psychotic – I don’t blame him. We tried some terrible wines today, but hey dude, wear a medical alert bracelet next time and I’ll bring the pepper spray. Sheesh! ← Just for Dad…what will these crafty winos think of next!